How did just one state achieve such a progressive approach to bicyclists and traffic controls? Great topic, important topic; its importance for active transport is not to be underestimated! I was involved in a study of the Idaho Stops law at the UC Berkeley School of Public Health. This included visiting Idaho, numerous interviews with key stakeholders, a survey, and video data collection, as well as comparing city traffic safety data with other cities. There was absolutely no indication that the Idaho Law had caused any harm. Boise was compared with the very similar Sacramento, and found to be much safer. Boise has the Idaho Law, Sacramento doesn’t. The most substantial piece of that study was a comparison with Sacramento, a city which is surprisingly similar in many ways. 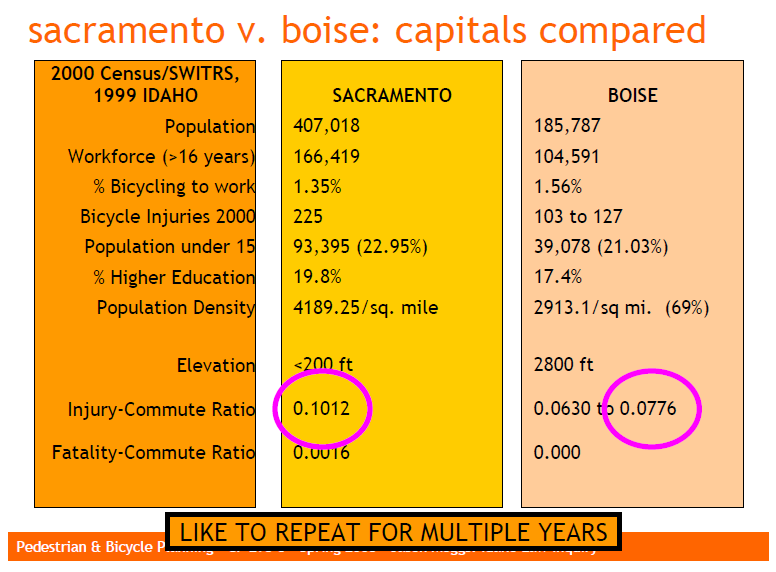 Sacramento appeared to be much more dangerous for cyclists than Idaho by all comparisons, with at least 30% (or 60%, depending on definitions of injury) more injuries per bicycle commuter, and regular fatalities each year, whereas Boise had NONE, year after year. This surprising difference year after year, from such similar cities, certainly dispels any “sky will fall” assumptions about the Idaho Law and lends strength to the supported hypothesis that the Idaho Law actually improves safety for all roadway users, and increases cycling. Other cities were also compared, and like Sacramento, all fared worse than Boise. In fact, quite a list of apparently attributable benefits for the Idaho Law were found. Increasing cycling, increasing cycling safety, increasing safety for all roadway users, and reducing the risk of injury including repetitive strain injuries, were among the benefits. One of the largest benefits of all is political; across the USA political opposition to bicycling is vehement, even violent in many cases many of you have heard of, in attempting to control and contain cycling for “flouting” the law. But whenever a law has such near universal non-compliance, by everyone from grandmothers to police officers, and especially grandmothers who are police officers, we owe it to all to revisit the law. The assumption that bicyclists follow all laws intended for motor vehicle users is highly flawed. No “warrants” (e.g., informed criteria) for cyclists to be held to stop signs and signals were developed in that broad sweeping legal measure (adopted by many states 50+ years ago, after the bicycle had been prominent in ground transport for about as many years without such control). Bear in mind that stop signs and signals would not exist as they do today, but for the motor vehicle. In fact, many stop signs and even many signals are what traffic engineering would call “unwarranted” for motor vehicles; they are used solely for traffic calming. Ironically, this occurs intensively on what many if not most consider the ideal cycling routes, quieter streets parallel to arterials (e.g., bicycle boulevards). Thus to stop cars from using residential cycle routes, we’ve en masse hurt cycling on those very routes. Adding stop signs can more than double a cyclist’s time spent, and more than triple the energy spent. No fun. It discourages cycling. Add to that the evidence that stop signs actually increase injuries, and the call for relaxing stops for cycling seems imperative. We don’t require walkers, runners, push-scooter operators, skateboarders, inline skaters, or electric wheelchair users to stop, yet those modes are as a strong general rule, much less able to avoid collisions…If we don’t require those active transport modes to stop, why would we ever require bicyclists to do so? We don’t require walkers, runners, push-scooter operators, skateboarders, inline skaters, or electric wheelchair users to stop, yet those modes are as a strong general rule, much less able to avoid collisions. In general their operation has a longer stopping distance and a larger turning radius, and a reduced ability to see and hear. If we don’t require those active transport modes to stop, why would we ever require bicyclists to do so? A major distinction must be made between choosing when to yield for safety, and taking right of way over all other users. There is no reason to believe that the Idaho Law increases disrespect for pedestrians, which is best addressed by other means than a mismatched stopping law. If anything, proper respect for bicyclists (including proper education and training) will help reduce conflicts and create a friendlier culture of inclusion. The Idaho Law allows prosecution of any cyclist who violates the right of way of not only a pedestrian, but other cyclists and motorists as well. I’m happy to provide the draft study and a policy document based on the study, and certainly welcome any help in completing and publishing the study. An earlier version of the paper is available here: idaho-law-jasonmeggs-2010version-2. Perhaps the most informative for a quick look is an even earlier presentation, available here: idaho-presentation. Presently I have an outstanding request for more data to the Idaho OHS, and a multi-city follow-up survey in the works. Your Agent Meggs has been asked to provide testimony to a number of states and cities considering adoption of their own long overdue version of this important, inexpensive, and broadly beneficial measure. In recent years numerous places in the U.S. have considered, and in some cases even introduced legislation, to adopt an Idaho Law, including Oregon, Arizona, Virginia, California, and Washington, D.C.
An example policy letter to share with decision makers can be found for download here: idaho-letter-jmeggs-20090627. I’m happy to also write a short letter introducing the latest version of my study, such as this one, available for download here. In addition to written testimony, I can be available for in-person oral testimony in support of legislation. And quite a perspective and discussion on the topic at the emphatically energetic On the Level Blog. The MeggsReport is cooking up a storm. We’ve been encouraged to self-report on personal cooking theory and practice; “not many people cook like you do.” Part chemist/alchemist, part traditional foods enthusiast (especially merging Chinese food theory with more universal traditions), this might seem a bit odd to most in the USA. So as a first glimpse, let’s take a quick look at a quick recent meal, noteworthy as it was made while traveling, yet adheres to principles usually used at home. Watch as Meggs magically transmogrifies available goodies into a pile of tasty sustenance, in short order, each element cooked to perfection yet in the same pot, served hot with not a BTU of energy wasted. Colorful and tasty, prepared with a select combination of health and sustainability guidelines. All with a minimum of clean-up! Fifteen minutes from first thought to table; Voilà! Voilà, a quick meal with Meggs! Meggs prepared this dish in under 15 minutes, following principles of health and sustainability.Meggs prepared this dish in under 15 minutes, following principles of health and sustainability. The day in question, Meggs was traveling, staying with friends in Philadelphia. 2) Cooking order and cooking intensity. Stalks and dense/root vegetables cut smaller and cooked first and longer, in a minimum of water (so material on bottom boils, material on top steams). Ginger was used for its health benefits and flavor, added first to cook longest, finely chopped. Leaves of greens tossed on top at the end as a secondary lid to absorb heat and retain heat, as the flame was reduced or turned off, so they cooked least; lightly cooked. 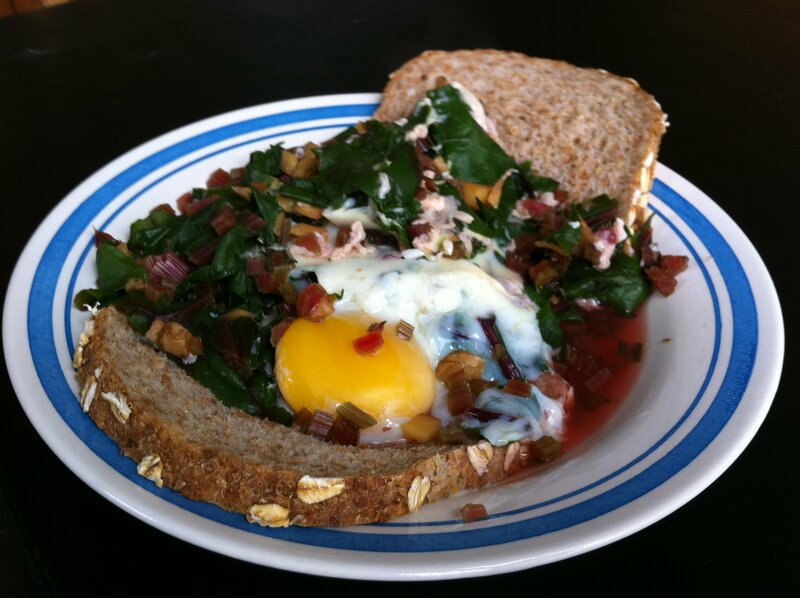 Egg added for nutrient density and animal proteins and fats, placed directly onto cooking vegetables when almost done. Egg yolk is important to eat raw. Whites one might minimally cook to destroy avidin (that reduces uptake of biotin, a B vitamin) so some would say the ideal is soft poaching, although others say the biotin in egg yolks make up for the avidin, and cooking destroys important complex nutrients. But here a partial cooking: the whites cook from the hot water a bit similar to egg drop soup but no stirring. Stirring destroys complex proteins. The vegetables were cut in the order of cooking, added as they were ready, so cooking/cutting times closely corresponded. 3) Energy savings (“Not a BTU wasted”). Bowl for eating first used as lid, warming it up, so bowl will not sap heat when soup is served (eating hot food is a goal too, and a cold soup is a let-down). Bread thawed/warmed in lid (serving bowl used as lid for pot) while food cooks, and/or placed around edges to steam thaw. (Toasting avoided due to acrylamide and nutrient destruction.) Bread placed at bottom of bowl when serving to ensure not frozen, and also thus made softer and easier to eat by absorbing the liquid. The liquid contains important extracts (e.g., vitamins and minerals) essential not to be wasted. Not to mention, that just in time cutting method. For additional flavor, spices and garlic can be added as appropriate. Garlic would be added near end to prevent cooking out healing properties. For saltiness and more fermented content, miso can be stirred in after boiling. To minimize disruption to the layered mix, pour off some hot liquid into the hot bowl, smash the miso with a spoon, then add the rest on top. Cayenne increases circulation and aids respiration, and good for certain conditions. Served in one motion by sliding out of the pan into the hot waiting bowl, preserving the pile; thus the presentation in the photo. Guidance from Chinese Medicine, particularly Paul Pitchford’s book, Healing with Whole Foods, and a nod to emerging trends: certainly the Traditional Foods Movement, public health issues (consideration for those intolerance to gluten and milk; diabetes epidemic; carcinogenicity of pesticides and some packaging and processing; strong association of processed foods with degenerative diseases; etc. ); healthy and more sustainable sourcing (pesticide free/Bio/Organic, homegrown or local if possible, etc.). And of course, the Pollan-ization. Not mentioned: the ease of sprouting while on the go, even while backpacking. Knowing that vegans may find the Mmm-eggs photo objectionable, apologies; in another tale I might discuss my own history with veganism and vegetarianism. (An interesting broader inquiry, for this Report or another news venue, would be: why so many longtime vegans and vegetarians, including outspoken organizers, in the San Francisco Bay Area/Berkeley (an epicenter) have quietly or not so quietly given up that practice.) Vegetarians as well as vegans may have issues with the Traditional Food movement, and related emerging trends like the Paleolithic Diet. An excellent resource for vegans and vegetarians which attempts to harmonize veg practices with traditional foods principles is found here. Surely some will also question raw eggs. The risk of salmonella, while real, I understand is extremely low if organic/pastured eggs are used, and even quite low if the riskiest, factory-farmed-torture-swill eggs are used. Two commercial sources that seem good on why raw eggs are highly beneficial to eat this one and this one. Thanks! We hope this is helpful. Your Meggsychef hopes to share more on dietary examples and perspectives in the future. Remember, everyone is different, there’s loads of info out there, and quite a lot of conflicting advice and opinions. This information is provided here to help you make better choices, not to tell you what to do. More sharing planned for the future on the Meggs Report. Updated October 11, 2012 due to changing information in the wiggly web world: folic acid reduction from uncooked egg whites no longer appears to be a concern, however now finding that biotin is said to be at least partially cancelled by avidin when whites are not cooked, e.g., here. A report from the Emergency Room, with a compassionate and accomplished doctor I’ve known a long time. “Americans are really sick. Sicker than ever. And the emergency rooms are really getting hit. Diabetes epidemic, obesity epidemic, the asthma epidemic, congestive heart failure, more and more renal failure from the diabetes, and then the psychiatric stuff. What’s really getting bad is depression. With psychotic breaks, they end up in the emergency room too. It’s all tied together. “By law, the ER must treat you before they ask your insurance status. So it’s not a bad law; it saves lives. But, it’s an unfunded law. And more and more people can’t pay. So the insurance companies, Medicare and Medicaid are cutting back reimbursement, so we ER docs are working harder and harder for less and less money. 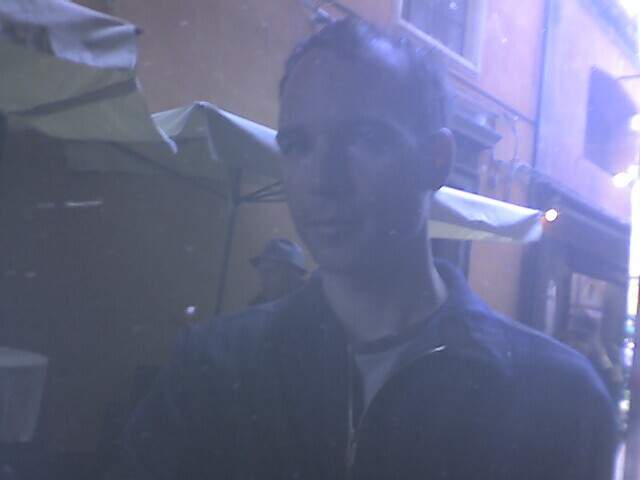 Landing in Bologna, my new home in Italy, I was not sorry that the plane was delayed for several more spins around the city. Mesmerizingly, from the air Bologna appeared as a medieval medallion on a tapestry of felted jade. One could almost pick it up from the fields and study its impossible intricacies. I watched in wonder. As if by a miracle, the city sported an abrupt urban growth boundary, immediately surrounded by what appeared to be family-based farmlands, a small collection of cultivated fields to each home. Where is the urban sprawl that houses the rest of the 400,000 some people of this metropolitan region? How did they maintain such a strong urban growth boundary? How promising! I looked forward to seeing the intricacies of that amazing-looking center below. After several days here in Bologna — the second largest medieval city center in Europe (after Venice, and also once a city of canals) — one would hope il Dott. Meggs would be in love with the beauty and delighted with this way of life. After all, the expectation indicators are strong for a place of paradise. Your Benevolent Meggsy is here at the oldest continuously operating university in the world, expressly to research and determine urban policy and actions to increase healthier, more sustainable modes of transport, and in large part thanks to my association with the World Carfree Network. Is it unreasonable to assume an enlightened, livable, relatively carfree place? One would eagerly anticipate this jewel of the Renaissance to be an urban paradise, particularly in Italy, the land of art and culture. Terribly, after a short time here, my only lasting impression of place was the rumbling, droning daily earthquake, the flood of hell and metal, the charge of deadly steel ripping around each corner, charging through each tiny path, defiling every space: the endless antagonistic automobiles; the torrents of motor scooters; the deluge of diesel buses; the putrid stench of their unmitigated effluence. Like a freight train crashing through church, like war at a wedding, attacking mercilessly; savage sloughs of speeding steel sewage spewing determined disrespect, a dragon’s blast of deadly noxious vapours; a poison cloud which lingers long after each platoon hath passed. Each CC sip of air inescapably stinking, a VOC coctail, a benzene and all admixture as if face full of a petrol pump; the explosive noise echoing cataclysmically; every air molecule buzzing stunned after shotgun blasts; as if the city were one giant, hyper raceway; as if a jackhammer the center of every living room. How can anyone accept a life like this? Particularly here, in a paradise of urban form! Worse, the aggressive disregard for the human being; the horn, the aggressive thrust and shove to prevent our crossing. Wouldn’t a civilised culture, one reputedly relaxed and sublime, rather roll down a window and ask politely, “scusi?” — not shoot us with the noise cannon, at point blank range? Wouldn’t its drivers choose a sensible speed, or better yet, an entirely more enlightened alternative? True, once a platoon has passed, there can be sweet silence in these Renaissance canyons, affording enough repose to gather a very different sense of place, where the ornate beauty emerges with that temporary peace. High above on a roof, a tree. Gently noticed, the chirp of birds. Ponder the play of light and its architects’ intent so many centuries past. And then they are upon us again. The people who dare venture by foot in this city, which was once a great gift for pedestrians, are now second and third class, subordinate to the mounted knights of petroleum. The men, women and children walking appear frightened, dazed, shell shocked, and hug the walls, waiting to pass, sharing but a narrow channel protected by steel posts as the raceway rules supreme. An older couple starts on a new street, feels the sunshine on their faces, appreciates the rare quiet as the arterial they’ve left falls away, seducing them into a false sense of safety. They walk in the street away from the constricting steel posts for the sun, thinking they can share the way which is wide enough for a car to pass. Think again. Deceptively calm, it was but a moment’s reprieve on the new street before the next attack. Without warning, without mercy, a car careens upon them and rushes to a stop a mere meter from their bodies, and promptly blasts its horn: piercing, shrieking, surely above 130 dBA, resounding off the sharp walls on every side. Hateful it seems; intended to harm. Harm it does. I spin on my heels as if to defend and see the poor older couple hobbling to the edge of the road, their peace shattered, their place stolen. The perpetrator writhes agonised: A 40-something woman with gold hair gripping at the wheel, gnawing at the air, face contorting with ugliness, screaming to herself inside her car, eyes wild with shrieking. As soon as it’s clear she rushes past without apology, a child’s tantrum runamok as gold-encrusted spectre, roars away followed by the rumbling of more monsters, new arrivals backing up behind her box, the endless insistence without reprieve. The raceway resumes. Look around: the walls of this ornate city are stained black from pollution, like a den of smokers, like the walls around a coal furnace. Immediately my response to this assault on life is to analyse each small street in light of what I have learned: Why is there traffic here? What can be done about it? Who makes these decisions, what data is available, what policies in place? I take a quick traffic count and estimate. 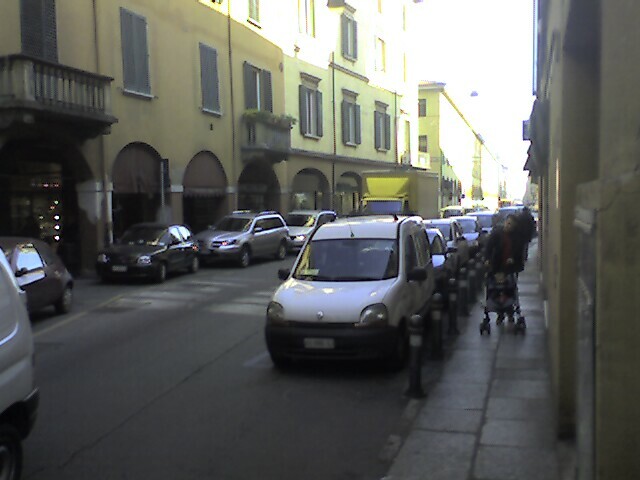 This narrow alley must see more than 10,000 vehicles per day! As a city the cumulative effects on health of such high volumes in a dense population center are staggering. Cancer, chronic stress leading to disease, hearing loss, curtailment of public freedom; and I’m told a recent inquiry estimated that the rate of injury and fatality is much higher than one would anticipate, despite the seemingly ubiquitous protections for pedestrians here including reportedly 40 km of porticoes — gorgeous covered walkways protected from traffic by stone columns and grade separation — and alleys like this one, lined with protective barriers. After all, a field lined with trenches and foxholes does not indicate a safer soldier; it indicates war. The devil is in the surprises at intersections, explained one transport professor at DICAM Transport Engineering Group, my new workplace. Without warning, a fast vehicle will shoot around a corner; there is no way for a pedestrian to react in time. Having seen a few days’ egregious misbehaviour, and many close calls, I believe it. Is there a solution? Appeal to culture, pleasure, tradition. The culture of Italians, I’m told, is aesthetic. Art dances with and seduces, bypasses reason. This is the global allure of Italy. 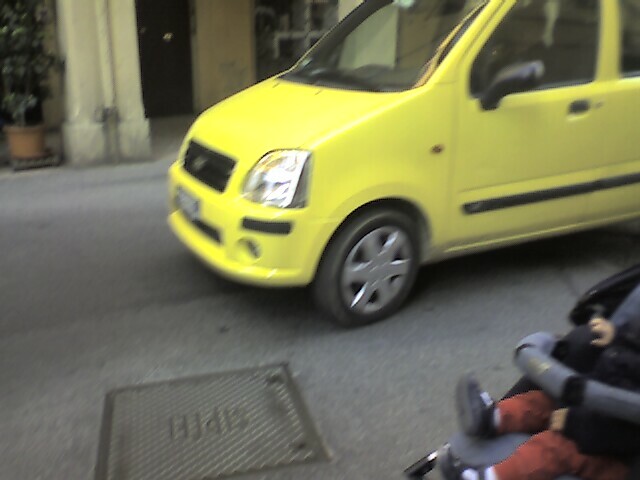 Yet here one wonders if the Italians have lost their senses, their culture to the automobile. Beauty is alive, resistance is smiling kindness. Fortuitously, my first day on the town I came upon a symbolic discovery: a sidewalk vendor of historic Bolgnan treasures offered a classic book on display, carefully packaged in a protective sheath: Uomo o Automobile? (Man or Automobile? ), a 1968 compilation of writings about the car and its effects. What a find! Relatedly, there was an engrossing book on the local antifascist resistance, WWII…I’d like to read both, but is it worth 13€ to me today? (My bank was not allowing me cash, incidentally.) I ask for a discount, 10€ for both, and the vendor, an old man, smiles and objects. No, he explains, I must take them both for 8€, not my 10€ offer, let alone the 13€ posted price. 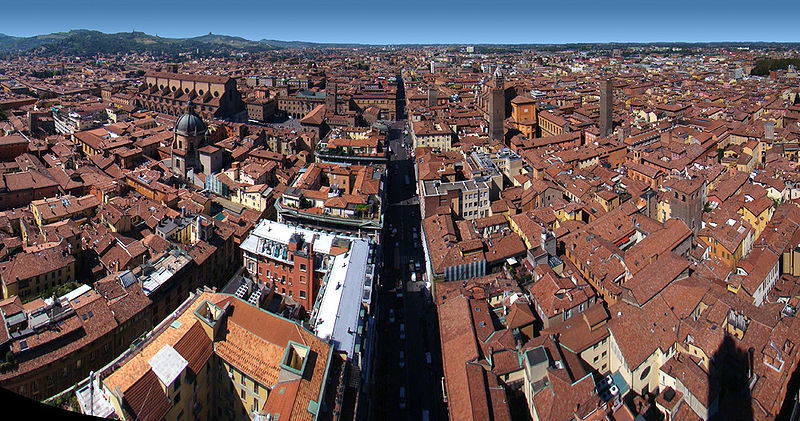 It’s a sign of hope that the power of community and the aesthetic potential of Bologna is yet alive despite the hostility of the traffic. Then there’s the news that the EU plans to ban combustion cars from cities by 2050, grand news, although that is just a partial action on a long timeline. How about a program to transition the motorized two-wheelers, which are arguably the biggest air and noise pollution problem, to battery and bicycle on a much shorter timeline? How about a community-based initiative to assess the streets and propose new protections and new policies for handling traffic flow? In any event, you couldn’t hope for a more prime natural candidate for a Carfree City, something the world is increasingly ready (and long overdue) for. Other signs of hope: a network of trolleybuses, my favourites! 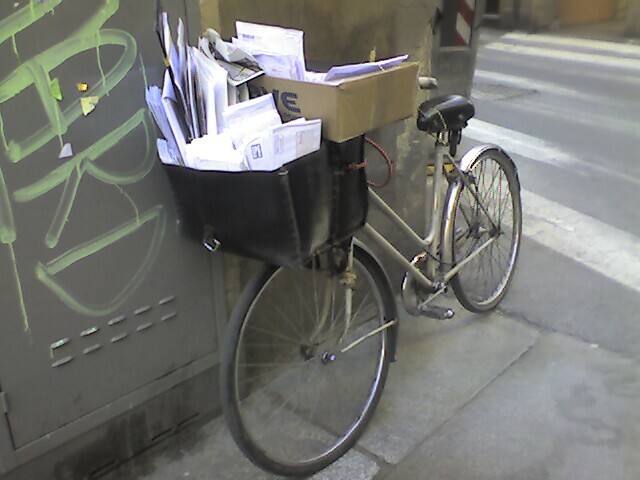 — although they are a tiny minority of the many buses; but many buses means frequent transit options, even late at night; and there are occasional carfree alleys and shopping areas, where motor vehicles are finally escaped; and even some brave souls who dare ride bicycles — in fact, the mail is delivered by bike! (See photo, below.) Then there is the fresh produce from local farms, the secret spaces from centuries past (catacombs included, both below and above ground) and the friendliness of those you meet — in public — those who are not grimacing at the wheel. Oh, and much of the sprawl is in dense corridors, although it continues to grow. It just wasn’t apparent from the plane that morning. 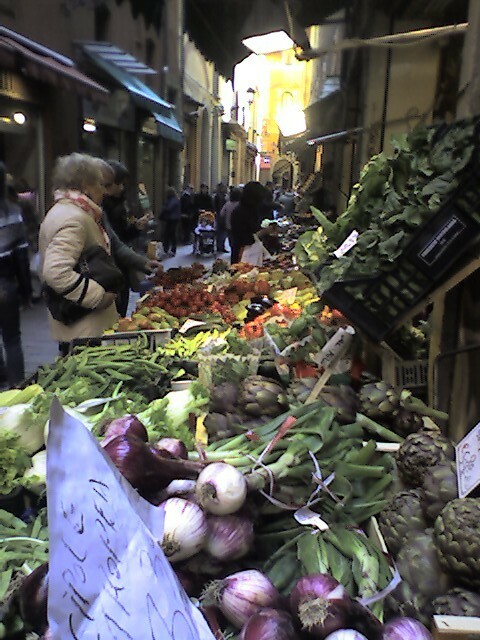 Local produce in markets near the grand plaza (Jason Meggs). Stay tuned as Your Meggsy investigates and considers solutions to make this diamond in the rough the happy, healthy gem it could be. Lastly, for the “bicycle crazies,” you might enjoy this article (translated and original). Create teams of experts ready to mobilize in support of political opportunities to make big changes in pursuit of healthier, more sustainable cities. In particular, the election of a visionary new mayor is an ideal example. Change is needed and change needs support. Everywhere around the world there are people who want and need change. They face barriers. They need to overcome those barriers. Some are members of the public. They live the reality that needs changing. Some are experts: planners, scientists, policy makers, researchers, advocates and engineers, who have thought about these problems and their solutions. They need the political opening to apply their knowledge to real solutions, and other with complementary skills to work with. And SOME are well-meaning elected officials, who face at times tremendous even crippling institutional resistance to make major changes, as well as a steep learning curve to apply cutting edge solutions to their particular problems. The key here is to align all three to work together. Thus when a forward thinking elected such as a new mayor comes to power, a new form of support is needed to coordinate and coalesce the investigation and implementation of those broad intentions. The people are already there, although they may need help coming together. The expert support may be lacking. Bring it to them! Obviously, the idea of maximizing achievements during political opportunity is not a new idea. However, the struggle to make change continues to grow and experiment. This proposal does appear to be a new idea. True, each change of administration typically involves a replacing of high level support staff and the selection of new appointments, certainly for presidents and other high-level electeds. Even that is not enough. Last night, attending the Sustainable Transport Award ceremony in Washington, D.C., presented by Institute for Transport & Development Policy (ITDP) during the 90th Annual Meeting of the Transportation Research Board, this idea came to mind again. Yes groups such as ITDP provide much support, however this idea differs even from NPO/NGO assistance, which is also very much needed. One recipient of an award, Francisco Sheffield, the mayor of León, México, expressed gratitude for being able to go back to the people of Léon with international validation for all the work being done there. What if a team of helpers went with that validation? Picture a team full of knowledge and vision assembled to support a mayor. In fact this is highly similar to what happened in Bogotá, Colombia, much celebrated for its rapid transformation. 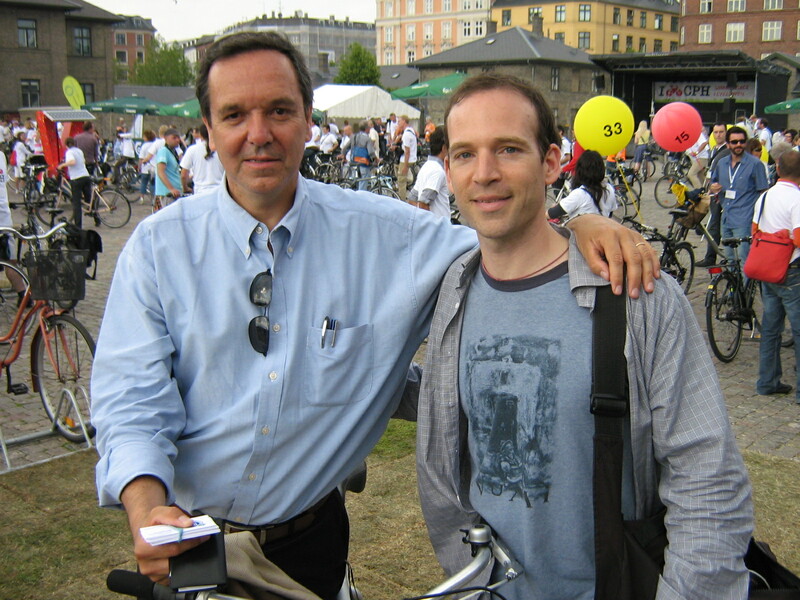 At Velo-City I broached this exciting idea to Gil Peñalosa, an advocate for sustainable transportation and livable cities, and brother of the former mayor of Bogotá, Enrique Peñalosa. Gil was standing in for his brother as a featured speaker. He liked the idea. Gil served as Commissioner of Parks during that legendary and tumultuous mayoral term, in which five megaprojects were championed, including the highly successful and now world-famous, premiere Bus Rapid Transit (BRT) project in the world, TransMilenio. Much was done for the transformation of public space, reduction of automobile use, and improvement of social equity, access and mobility. Gil concurred that a large part of the success in Bogotá at that time was the special formation of a top level of supermanagers to bring together interdepartmental cooperation. Often in city government there are institutional legacies which inhibit change. Departmental isolation or “siloization” is one meta-example. A team of coordinators helps them see the way to working together to fulfil a grand clear vision. Thus I’m tentatively calling this collaborative response team idea the “SWOT” team, derived from the “SWAT” emergency response teams (highly trained response teams sent to save people in crisis situations, with an exciting theme song from the classic teevee show), and the “SWOT Analysis” methodology, although this idea goes beyond identifying Strengths, Weaknesses, Opportunities and Threats to strategic engagement and active implementation. How can the movement for more sustainable, healthier, and more livable, lovable cities step up its involvement to really find the force of leverage and carry forward political openings? There is so much that can be done, even quickly and inexpensively, which saves lives, saves money, protects human and environmental health, and makes people happy. All that is really needed is the political will and good guidance. Here is a call to bring these together. I for one would love to participate in such a collaboration. In the meantime I hum a few bars of Rhythm Heritage action anthem when not pulsing the active transport drumbeat to the old standby, the Mission Impossible theme song. Berkeley, CA: Today, October 10, 2010 (10-10-10, a Global Day of Climate Action by http://www.350.org/), an ambitious new campaign was launched by the East Bay Bicycle Coalition (EBBC): ONE-THOUSAND NEW CYCLISTS! Gearing up to increase the ranks: 1,000 new cyclists is the goal. The numerically inclined will be delighted that 10*10*10 = 1,000. Those of us who live and breathe to increase bicycling are even more delighted by this mobilization. Certainly the large group who came together to brainstorm the campaign this morning is eager for success. For many years people have grappled with the issue of increasing cycling. Supportive policies abound, but inaction has long been the rule. Even with the imperatives of Climate Change, oil addiction/instability and pandemic health problems stemming from motorcar hegemony, yet the elegant solution of bicycling (fast, cheap, fun, reliable, and effective on every front) has too often been relegated to the gutter by cities and states of the USA, despite glowing examples of effective implementation in many European cities and a swelling “critical mass” of activity by advocacy groups, supportive electeds, and the public at large. This important job has been left again to We the People. So, you may ask: How does one increase bicycling, anyway? Ah, the 1,000-times-asked question. There are many schools of thought on this, and more than a few research inquiries. The philosophy of the 1,000 New Cyclists campaign is to build on what we know has worked in the past: social networking. “Most of us began riding because of the good example and encouragement of someone close to us,” declared campaign leader Stacy Jackson, a doctoral candidate at UC Berkeley’s Energy and Resources Group. Three new cyclists for the price of one! The campaign has already convinced a number of people to join the ranks of everyday cyclists: New Cyclist #2 on the roll to 1,000 was present and says he started for health reasons; at his 40th High School reunion, he wasn’t able to dominate the dance floor like the old days and his wife has been chiding him for being lazy. “I work with kids, so it’s time for me to walk the walk if I’m going to talk the talk,” he pledged, perspiration from an earlier climate action ride adding credence to his conviction. 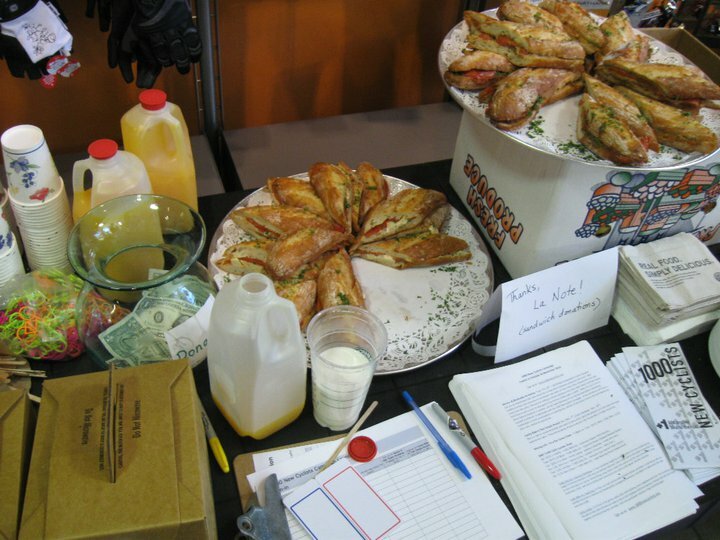 Hordes of cyclists descended on the event despite complimentary gourmet food deliciousness. It was more than just the food! Chuck Siegal of The Preservation Insititute, advocate of a reduced work week and author of numerous books including The Politics of Simple Living offered that his desire to escape consumerism inspired his choice of bicycling. “Plus, I’m a cheapskate” he smiled. Health issues were also high on the list; not only because of meeting daily exercise goals for a healthier and happier, longer life. “I always feel better when I ride my bike” said Marcy Greenhut, member of the Board of Directors of Berkeley’s 15-year-strong bicycle coalition, http://www.bfbc.org/. SAFETY is one major reason for riding. In fact, simply getting more riders on bicycles is widely expected to increase safety for all through the dramatic if somewhat mysterious Safety in Numbers effect. For example, Portland, Oregon saw a five-fold increase in ridership over the past decade yet the number of injuries for bicyclists didn’t change — thus, everyone riding is on average much safer now. Research indicates this is true from city to city, and even from street to street. Safety, happiness, health, convenience, money…what else? Contrary to what one might expect, preventing climate change and helping the environment were not primary motivations for most attendees, despite the theme of the day. In fact, in a survey conducted by the campaign before its launch, which garnered hundreds of detailed responses, this was also the case. Time, health, and money were valued much higher by respondents, most of whom are regular riders. However, many do care about the environment. Getting in better touch with nature and its geography was voiced by many in the group. Hal Keenan related how his first rides took him on paths along the water in the middle of the night. He was amazed at the wildlife that joined him as if playing. “One night a fox ran along ahead of me for quite a while. Then a skunk came and ran alongside at 15 mph, just keeping me company! More than anything opossums ran with me. I was really amazed to see all that.” Berkeley’s Climate Action Plan and many other authorities strongly say that the most effective personal action to reduce climate emissions that the average person in the USA can take in their own lives is to replace car trips. Advocates are thus hopeful that the City will begin actively promoting and providing for bicycling in a much greater way. Berkeley is blessed with a project which helps people with disabilities find a specially designed bicycle which works for them, The Adaptive Cycling Center (BORP) at Aquatic Park. This principle can be expanded on to include anyone with special needs. Lucianne Resnik, who was involved in the founding of Berkeley’s Bicycle Coalition (BFBC) with her husband Hank Resnik, used to offer trainings and special outings for older cyclists. As society braces for an aging demographic, providing viable travel options that don’t require driving is more important than ever. The extra good news: bicycling is low or no-impact, great aerobic exercise which helps keep people young and able-bodied, staying above the disability threshold to live a longer, happier life. There are many people who rely on bicycling for exercise that they can’t get other ways, and conveniently obtained while pursuing everyday travel. Do’s and Don’t’s: “Don’t preach, be patient and supportive” was a primary theme here. This really became a focal point for outreach ideas. Meggs observed that the highly successful “Travel Choice” and “Travel Smart” strategy of knocking door to door and sitting at the kitchen table with receptive families and households, to help them assess their potential to reduce car use, would be a good strategy to employ. Families and kids: The success of the free family ice cream rides organized by Alameda Bicycle were influential here. 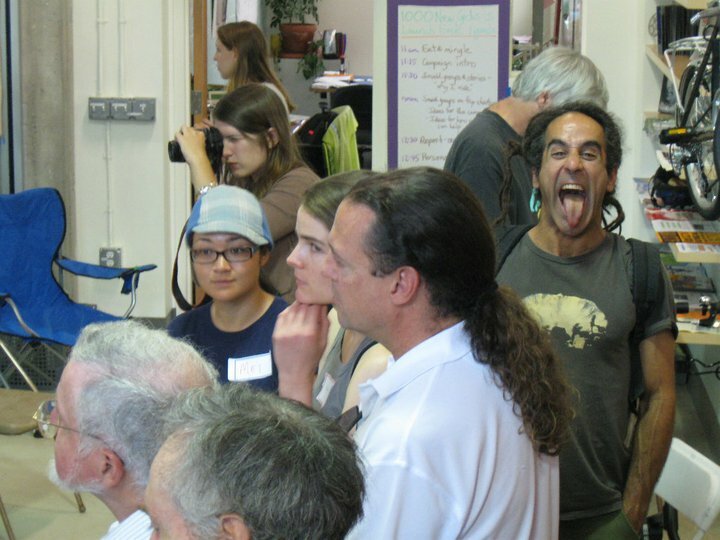 Community-based rides hadn’t succeeded as well in Berkeley, suggesting the official sponsorship and technical support of a well-known shop, along with the promise of ice cream at the end, offered a winning combination. This is evidenced by the ride attracting 90-130 attendees when the program reached full swing. (Kids are motivated to join by ice cream and the fun of the event, while parents are further motivated by having a child do something healthy and social to get a treat.) So successful it was that they found they needed to split the group into the little kids and the faster bigger kids and teens. Other topics included addressing barriers to cycling, and more. Bicycle Theft was identified as a major deterrent to cycling. Many people begin riding as a new cyclist, not knowing how to properly lock their bicycle; once it’s gone (in the blink of an eye), they may not try again. However, many everyday bicyclists go many years without losing their bicycle by following a few basic practices which anyone can and must learn before leaving their bicycle unattended — anywhere — even inside a home! The very Bike Station where the meeting was held was created to retain bicycles (and thus bicyclists) by BFBC, in partnership with BART, the City of Berkeley, the Air District, and others, (now under management in a fabulous new location by Alameda Bicycle). This was done in because BART stations are primary centers of risk where epidemic bicycle theft occurs (not just of whole bicycles, but of parts from bicycles). Thus one rule of thumb is to never park at a BART station; or at least, to bring a lower value “BART beater bike” and lock it very well. Obviously this is no good because a bicycle is the perfect way of arriving at a BART station for many! New regional efforts such as BikeLink provide new low cost options for secure parking storage at an ever growing number of destinations, particularly near BART and other transit stations. Bringing the Bike Station to its new larger and more accessible street level required ten years of dedicated work by BFBC volunteers. Meggs reported that while managing the Berkeley Bike Station, he developed several flyers with BFBC to post on at-risk bicycles, warning their owners of risks they’d taken. The flyers had check boxes such as “quick release wheels not locked, easily removed and stolen” and were personalized; “Hi, My name is Jason and I hope your bicycle is still here when you get back!” To be discrete, the flyer was folded over so only plain paper showed, and then stapled around the handlebars to stay put. One version of the flyer urged cyclists to use the Bike Station, even though it was bursting at the gills. For illustration purposes only (and with outdated contact information), one version of the flyer is HERE (PDF). The back could be printed with a warning so people knew to open it up and look at the other side (the warning was not visible when folded and stapled to the bike). That page is HERE (PDF). The crowd Ooooohed, Aaaaaahed and laughed, cheered by the thought of directly helping strangers save their bikes. Cultural events, rides and even Halloween strategies filled a good portion of the rest of the proverbial pannier, in discussing how to carry forth the ONE-THOUSAND NEW CYCLISTS campaign. Some of the more mischievous attendees plotted to win hearts and minds through fun and frolic, with upcoming Halloween (10-31-10) an opportunity for shock therapy and ghost riding. Note that 10*31*10 is 3100, much more than a mere 1,000; so confident are they that they predict more than triple the results with this method!!! “This campaign has the potential to grow and continue even after we reach 1,000 cyclists. Unlike some campaigns that are anti-climactic and lose the energy which has built up, this one can continue to be fine-tuned and to sustain itself. We’re really breaking new ground here which can lead to tremendous long-term results as we organize to fulfill what is really this great community need. 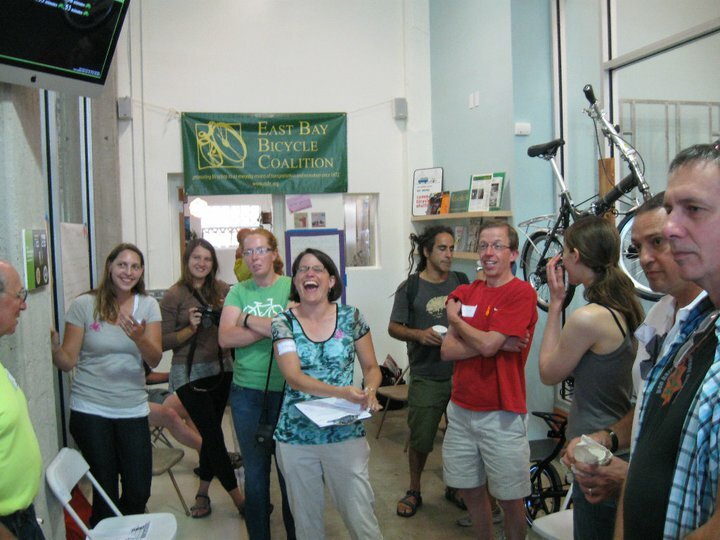 It’s really exciting!” said Phil Morton, member of the Board of Directors of Berkeley’s Bicycle Coalition, BFBC. EBBC, its member groups, and local bicycle shops already have many resources to offer prospective new cyclists in enticing them into the fold. New Street Skills classes are one, a tremendous and free opportunity to gain confidence and experience for cyclists of any skill level. Local recreational clubs such as the Grizzly Peak Cyclists offer shorter rides for beginning cyclists among their many organized group rides. Thanks to the extensive efforts of the outstanding new group, Walk Oakland Bike Oakland (WOBO), the East Bay has enjoyed its first Ciclovía (Oaklavía), in which a network of streets are closed to car traffic so all ages and abilities can enjoy the complete street as safe and fun public space. Every May there is a major regional mobilization around Bike to Work Day, organized centrally by the Bay Area Bicycle Coalition and carried out by local bicycle groups such as EBBC, SFBC, MCBC, SVBC, and more. Missing Link Bicycle Collective hosts free Bicycle Repair Classes as well as free tool stations, and a variety of community-based bicycle repair shops offer inexpensive or free access to parts, tools and assistance. In East Oakland there is The Bikery and at Aquatic Park (adjacent to the Adaptive Cycling Center mentioned above) there is Street Level Cycles at the Waterside Workshops, to name just a few. Free flat repair courses were taught today as part of the 10-10-10 events. And of course there are legions of everyday cyclists who love to answer questions and offer help (just ask one!). Anyone familiar with urban cycling knows there is tremendous untapped potential to get more folks riding for everyday travel. Once their initial barriers are overcome, people find again and again that those many benefits keep them coming back to bicycling; it’s a joy, not a chore. Riding is an investment in a whole new you. Most automobile trips in the USA are short trips easily accomplished by bicycle. Again and again we see new cyclists amazed at how easily and quickly they arrive at destinations they previously thought required a car, even several miles away. This of course, only if there’s a way to get there. “Most often, bicycle advocates focus on infrastructure, trying to ensure a safe route between home and destinations, and a safe place to keep your bike when you arrive,” said campaign leader Jackson. Cyclists set a good behavioural example by laughing heartily during serious meetings. Some say infrastructure should be the primary focus until cycling hits 10%. 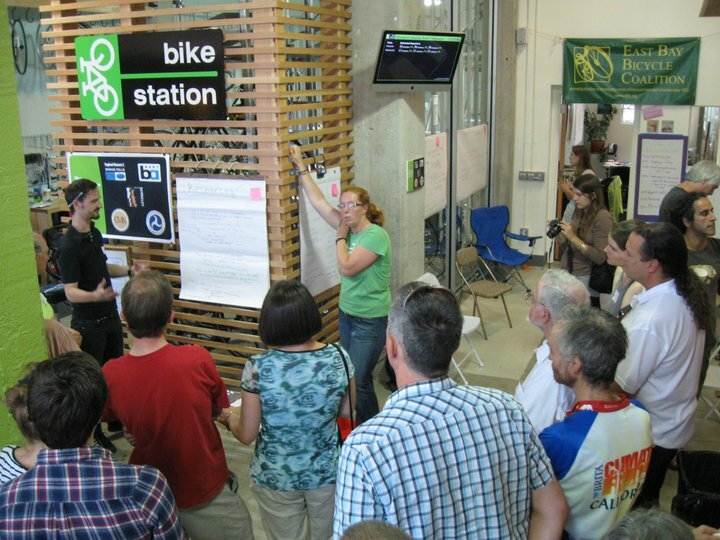 An influential workshop at Velo-City Global 2010 (the largest bicycle conference in the world) discussed just this; anything below 10% is a “Starter City” under this theory. Then, it declares, promotion of riding can begin in earnest. However, there is no doubt that enough infrastructure exists to add far more than 1,000 new cyclists to our streets and no systematic campaign to do so has yet been attempted. This effort is poised to break records and our perception of what’s possible, just as athletes broke the four-minute mile. [Note, Meggs was fortunate to attend said workshop this year in Copenhagen, a city of cyclists! That conference adventure shall be the topic of an upcoming blog post and presentation, recently given as well). Being counted among the 1,000 New Cyclists does not require anyone to give up their car. Of course the private automobile is a huge public health problem, and a sustainability problem on all fronts: economic, environment, health, and more. This author applauds the work at http://carfree.com/. However, the campaign is not focused on the car. The principle goal here is to help people find out if cycling is for them, even if it’s only for occasional trips. It’s the closest thing to being a bird. Alternate title: Lemons and Teethers and Babes, Hoho! Professor Búbú, Minister of Baby Affairs, gives a lecture on the benefits of citrusphilia for the orally fixated, entitled, "Lauding the Lemon: Lucky Licky Lavey Ravey." An organic alternative to synthetic pacifiers and damaging dusts. Babies are delicate in ways unseen. Our knowledge of their vulnerabilities continues to improve; much has been learned in recent years alone, and more can be expected. Care needs to be taken to best ensure a healthy and long life. The very young are at elevated risk for developmental harms as a result of exposure to environmental pollution. They are as a rule much more vulnerable than their parents to ambient environmental conditions — not only the obvious issues such as temperature, but also to noise (which causes hearing damage and psychological harm), and toxic chemicals (which cause physiological and psychological harm). Even the unborn are at risk; for example, it is now known that many childhood leukemias actually begin in the womb. Prenatal care is of utmost import to a healthy life: Not only to provide good nutrition (which allows development to full potential while preventing birth defects), but to avoid myriad toxins, such as mercury found at alarmingly high levels in certain fish such as tuna (which, tragically, government WIC programs have encouraged poor mothers to buy, probably to increase omega-3s in the diet, yet most canned tuna is low in fat and high in meat protein — the mercury collects in the meat, not the fat, so a situation worse than failure results). Because households, and foods, have so many new and poorly understood harmful substances, protecting babes and toddlers becomes a challenge. Ironically, this goal of protecting the young against environmental toxins is made much more difficult by nature, for the very young are naturally likely to seek out and ingest harmful chemicals found in their environment again and again, moment to moment, due to their orally focused exploration of the world and their frequent bodily contact with floors where dusts collect. On the one hand, it is harmful to keep babies from exploring their world, and over-protection can in general lead to hypersensitization later (for example, to noise during sleep, or to illness if biological pathogens which help develop an immune system are excluded). Yet dust can contain harmful carcinogens, neurotoxins, and more which have no known benefit and are difficult to prevent contact with. Over-protection then becomes impossible, so hyper vigilance is justified. For example, there is no safe level for lead, which is commonly found in such sources as everyday tap water, household dust, and of course in chipping paint (lead paint chips actually taste sweet like candy, greatly increasing the risk of ingestion). These everyday sources may contain very dangerous levels, yet the public is not being adequately protected and most are generally unaware of their risk, which varies from home to home and is typically not screened by tests. Simply allowing a child to play on a linoleum floor may lead to exposure to harmful phthalates, which are endocrine disruptors able to cause serious health effects, particularly during a child’s development. Cell phones, now commonly at baby level as caregivers talk on the phone while holding an infant, can find their way into a babe’s mouth, allowing highly toxic fire retardant chemicals to be ingested. Even pacifiers intended for babies’ mouths, and many toys which end up in babies’ mouths, are made from plastic and/or are painted, raising concerns about even those things intended for a baby to play with. Plastics can contain many harmful chemicals including phthalates and nitrosamines. Babies need things to chew on. What is safe? In an effort to assist in new best practices, Meggs experimented with offering presumed-safe, organic plant-based alternatives for chew toys, in hopes of shifting baby mouth-time to something safer than floors, doors, dust, paints and plastics. A lemon was found very effective. Only a clean, organic (pesticide-free/Bio) lemon was used. 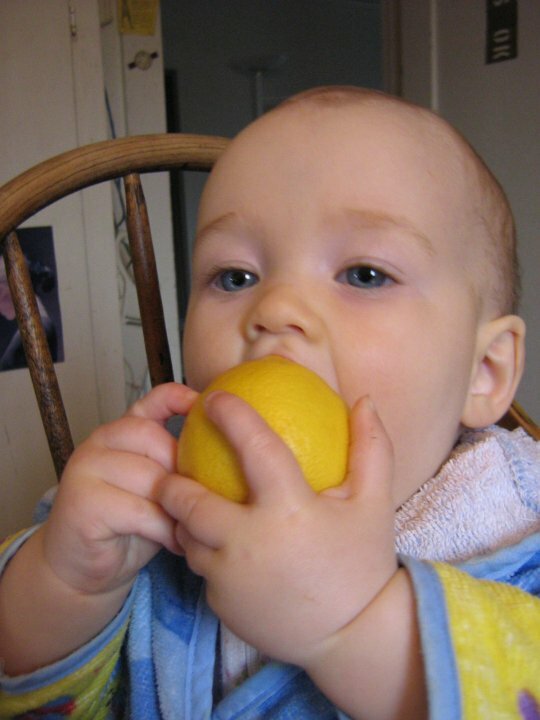 The pesticides found on ‘conventional’ (sprayed/conventional/non-Bio/non-organic) lemons are of course dangerous for babies. Professor Búbú, Minister of Baby Affairs, enjoyed a good lemon-as-pacifier alternative rather than chew on the many plastic or painted objects that otherwise prevail. 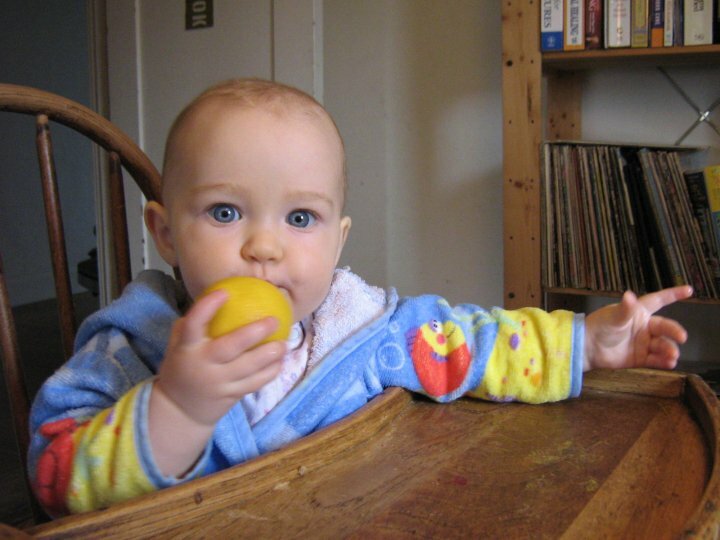 Despite the potential for sourness, this 8-10 month old human subject (pictured), sporting a few small teeth, thoroughly bonded with the lemon-as-pacifier, preferring it to other chew toys. The baby requested it again and again over a period of an hour, and even left the house suckling on it. No sour-face response was seen, and no tooth scratches were visible on the lemon. By encouraging use of a more natural object, exposure to random unhealthy dangers can be reduced. The Indoor Exposure Assessment Division of the California Air Resources Board was consulted and did not know of any negative effects lemons might have. Keeping floors clean and minimizing the presence of toxins in the house is of course a complex and important measure to pursue as well. There is a chance that there are unknown risks to lemons; however, lemons are edible and are associated with positive health effects generally. For instance, their juice is valued for cleansing of the liver. Citrus skin is said to be edible and to potentiate the absorption of vitamin C from the fruit. Thus oral contact with the skin of a lemon, if it is clean and free of pesticides, may very well be harmless or even beneficial. Additional benefits to lemons include their bright yellow color, their natural feel, their lack of hard surfaces, and their durability; babies can drop a lemon over and over without damaging it. Cleaning dropped lemons of harmful dusts from floors is advised. See also California’s Personal Exposure Assessment Program.